I woke up yesterday to clear blue skies and calm water, which would be great every other day in Hawaii, except for a Colorado girl like me, that meant a lot of HEAT. The race started with a 1.5 km swim off Makena Beach. The swim is gorgeous but it didn’t go as well as I had hoped. 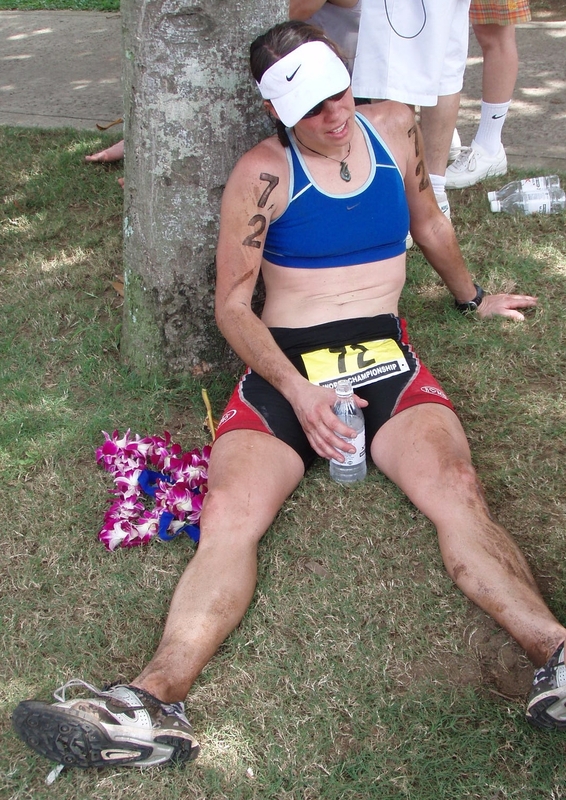 I’ve now learned that many of the women wear XTERRA Speedsuits when we are not allowed to wear full wetsuits. The Speedsuits help with flotation and reducing drag in the water. I think I need one to help with my swim. That, and LOTS more time in the pool this winter. Starting with a bad swim makes the rest of the race mentally tough. I felt like I never got my rhythm on the bike and couldn’t really get going. I was fortunate enough to have no mechanicals or flats but it still wasn’t quite enough. I survived the run and crossed the finish line in 15th. Not terrible but a little disappointing. Just that much more motivation to get better at swimming and race better next year. I want to congratulate Danelle Kabush (2nd place) and Jenny Tobin (7th) on their awesome finishes! These are two moms that ROCK and motivate me! Congrats on finishing, sorry it wasn’t what you’d hoped for… but I’m sure you’ve learned something for next year. So what’s the deal with the speed suits? They are legal? But wet suits aren’t? I wonder how much they help with floatation… I thought that’s why you aren’t allowed to wear wet suits in warm water… because they were too much of an aide to floatation. Anyway… all in all! Good job! Certainly you’re an inspiration to athletes (and moms) everywhere! Nice work Sari! Stick you toes in the warm, Hawaiin sand for me! You’re so awesome! 15th is pretty damn good at the Xterra Worlds. The competition is fierce, the swim is hard and you’re an amazing mom. I don’t know how you do it!